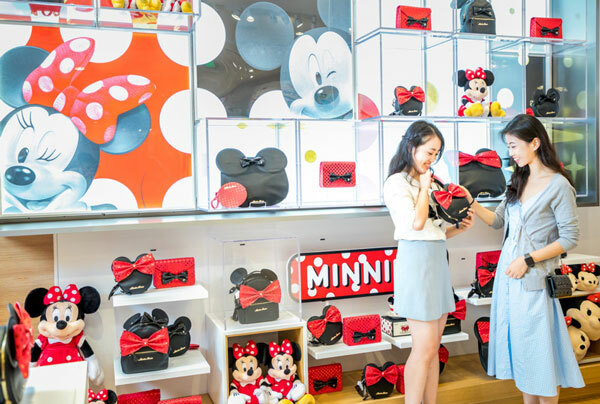 Disney Store opened the doors of its newest store at the HKRI Taikoo Hui Mall in Shanghai. Located in one of the city's most vibrant shopping and entertainment hubs, Disney Store will provide consumers locally designed and exclusive merchandise and a uniquely Disney shopping experiences. "We're committed to bringing consumers new, immersive retail experiences and high-quality products from Disney, Pixar, Marvel and Star Wars," Mr. Kermid Rahman, Vice President and General Manager of Disney Consumer Products and Interactive, China, said. "This new store complements our comprehensive retail offering that includes licensing and e-commerce and delivers a mix of unique locally and internationally designed products." The launch of Disney Store's first China-exclusive high-end fashion collection of bags called M28 Mickey Collection. The striking collection features a black theme color and Mickey's iconic white gloves as the key design element. The new collection signals Disney's ongoing push into high fashion in China. For the first two weeks of opening the store will feature an exclusive Golden Metallic Mickey Wall with 888 limited-edition metallic color Mickey plush key chains hung from ceiling to floor. The numbered key chains can be pre-ordered in the grand opening period of new store opening. To promote the new Disney Store opening, Disney Store and Mobike co-launched marketing campaign, rolling out special Mickey & Minnie Mobike across Shanghai. The Mall offers consumers a fun-filled Disney themed bike-riding experience which allows them to enter a lucky draw featuring gifts from Disney Store. The interior of the new Disney Store features uniquely Disney images and immersive elements. A large LED screen at the entrance of the store will entertain customers with Disney stories and characters from across Disney, Pixar, Marvel and Star Wars in a special and interactive way. Disney Store now has two locations in China – Shanghai Lujiazui Flagship Store and Disney Store at HKRI Taikoo Hui, Shanghai; and two online stores on Tmall – Disney.tmall.com and disneyfashion.tmall.com. The first Disney store in China, located in Lujiazui area, has become a popular shopping destination in Shanghai and a national landmark of retail and tourism since its opening.